Take some time out of your busy schedule to relax when you retreat to one of these great spa getaways in NY. Listed here are great places for weekend spa getaways in NY choose a spa retreat NY can offer whether it's in the mountains of Upstate NY or a haven of tranquility in the heart of Manhattan. Relax and Renew your Mind and Body! Get away from the busyness of daily life and spend a weekend at this holistic spa and health retreat. Just two hours outside of New York City this retreat has bed and breakfast style accommodations while also having an extensive spa facility. Spend your days meditating in quiet, soaking in the tranquil heated pool, relaxing in the sauna or exploring the mountains outside your door. During your stay, rejuvenate your body with massage, facials and alternative therapies from Sanivan's expert healers. If you don't want to do a weekend getaway Sanivan offers day spa options by the half-day or by individual treatment, so take advantage of this great NY spa getaway! Located in the beautiful Catskill mountains, this spa getaway in NY is a haven of peace and quiet. Experience world class hospitality when you stay in one of the comfortable rooms available at this retreat. When you stay you can take advantage of the many spa treatments offered such as aromatherapy massage, shiatsu massage, facials, wraps, manicures and a wide range of other rejuvenating and refreshing experiences. When you aren't relaxing in the spa or in your room you can see the grounds and go biking or hiking, take nature walks, sit on the streamside deck and soak up the sun or explore Copperhood's private island. Retreat without Leaving the City! When you book weekend spa getaways in NY at this luxurious hotel you will find the rejuvenation you crave. Choose their "Escape" package and receive two nights in one of their beautifully appointed guest rooms, breakfast each morning either in your room or in the Ai Fiori restaurant, $150 Auriga spa credit each day and access to the hotel's 24 hour fitness center in addition to the hotels usual amenities. Located in the heart of New York City this retreat is ideal for those who don't want to go far from civilization but need some rest and quiet. The Auriga spa offers a wide menu of treatments, massages, wraps, bats, exfoliation and more to get your mind and body just where they need to be. Unrivaled Spa Getaway in NY! This relaxing spa in New York is the perfect place to get away from busy life for a day or a weekend. Its location just beneath the W New York hotel means you won't have to go far to get from relaxing in your room to relaxing in the spa. Or if you'd rather not leave your room at all, in-room massages by massage therapists from Bliss are available right in your hotel room. Rub away your problems when you choose one of Bliss's many massages or deep tissue treatments. 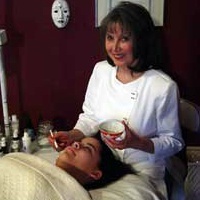 Body wraps, facials, waxing and manicures and pedicures are available by their experts. Located in midtown Manhattan there is plenty to see and do while you are not being pampered, making this the perfect place for weekend spa getaways in NY. This luxury hotel and spa overlooks Columbus Circle and beautiful Central Park and is an ideal location for an escape from the bustle of city life. When you book your stay you can choose a special spa package such as Suite Temptations or the Ultimate 24 Hour Detox Spa Package which include spa credit and specific treatments or you can book a regular room and choose how many or few treatments you want from the spa's extensive menu. The Spa at Mandarin Oriental is a luxury full service spa featuring several treatment rooms with private showers, relaxation lounges, a Thai Yoga Suite, steam rooms, a lap pool and much more designed to enhance your New York spa retreat. When you book with their "Rejuvenate You" package you will receive a 50 minute spa treatment and facials for two along with your overnight accommodations at this world class hotel. Add on to that any extra treatments you choose from the spa menu including various types of massage and reflexology, skin treatments, facials and nail treatments. If you're not sure what you'd like, spa reservation agents can help you choose just the right treatments for your situation. When you aren't luxuriating in the calming atmosphere of the spa, Central Park and the rest of Manhattan is just outside your door. Museums, cafes, shopping and relaxing are available mere steps away. New York Spa Retreat Less than 2 Hours from NYC! This destination spa is perfect for those who need to unwind without going too far away from the city. Located in Wading River this beautiful resort has richly appointed guest rooms and suites for your ultimate comfort during your stay. Choose one of their spa and stay packages such as Couples Indulgence, Suite Engagement or Serenity Now. A range of facial therapies, massages, manicures and pedicures, body treatments and waxing are available at the spa along with the extra indulgence of in-room massages for those who just don't want to leave the comfort of their room. Day Spa Resort in Queens! This spa is a truly unique getaway from daily life. Unlike many spa getaways in New York this spa is modeled after a combination of Asian and European saunas and spas. In addition to massages, body treatments, facials, manicures and pedicures, you can spend the rest of your day relaxing in the many rooms and pools each with a different theme and focus. Seven different themed sauna rooms are available including a salt sauna room, a gold sauna room and an L.E.D sauna room. Spend time in the many lounge chairs or relaxation rooms or sample the pools - each with a different focus on an aspect of health and relaxation. When you book a getaway at this spa resort in the Hamptons you will experience beautiful scenery, a calming atmosphere, handsomely appointed rooms and star treatment. Choose one of their tasteful state rooms or suites for your stay and spend your days treating yourself to some pampering in the Sea Water Spa. Saunas, steam rooms, pools and a fitness center are relaxing places to spend your downtime between massages, skin treatments, facials and wraps. Spend some time adventuring outdoors and biking some trails, walking along the shore, sunbathing on the beach or shopping in the many boutique shops nearby. Special offers change regularly so see what spa and stay packages will be available during the time you want to go by visiting their website. Spend a whole day at the Mermaid Spa relaxing and getting back in touch with inner peace and calm. These Russian baths and spa are some of the best in the area. With three Russian steam rooms, a dry sauna, a Turkish bath, cold tile pools and a huge jacuzzi to relax in you won't lack for new locations to rest and rejuvenate your body. Have a deep tissue or Swedish massage for extra relaxation or try the traditional Russian venik massage with birch twigs. This beautiful spa is made of slate and wood to promote a warm environment reminiscent of Russian banya. Get the Most Relaxation Possible out of your Day! This New York spa retreat boasts itself as Brooklyn's destination spa. You will find a truly relaxing time when you make it your destination. Choose one of the many packages and stay for a day, relaxing in the calm ambiance of d'mai's beautiful facility. The "Transformation Journey" package will take you through the day with massages, facials, manicures, pedicures and even a light lunch. You'll feel like you've been on a vacation when you leave d'mai completely relaxed and rejuvenated. If you don't want to take advantage of a day package, choose your own treatments from the extensive menu and be pampered by the massage therapists and relaxation specialists at d'mai. When you stay at the Hilton Garden Inn you can treat yourself to a weekend of indulgence and pampering. The Grotto Spa, located within the hotel is a full service spa offering massage therapy, body treatments, facials, manicures, pedicures and waxing. You will love their spa packages which consist of wonderful combinations of specialized massages, facials and more. If you want to spend your whole day in luxury book one of their three and a half hour packages and let your worries and cares be massaged away. When you aren't soaking up the atmosphere of the spa or being treated royally by the professional spa staff you can enjoy world class accommodations at the Hilton or explore Staten Island - a place full of history and nature. If you need a day to get away from life in the city, travel to Relax on Cloud Nine, a day spa that will help melt your cares away. Located in a quaint house, this spa's homey and relaxed atmosphere will put you at ease right away. 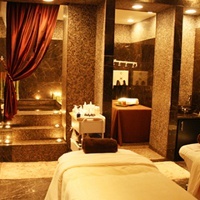 Choose from a large menu of treatments and massages by licensed specialists. For a whole day worth of relaxation and pampering that will leave you glowing, choose one of their packages such as The Great Escape - 4 hours of indulgence. In addition to usual spa offerings, this New York spa retreat offers classes in body awareness. 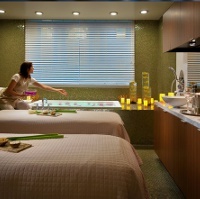 Take a day out of your busy schedule for a mini-getaway when you book a spa package at Ascend Day Spa. You will forget your stresses and worries as you receive a relaxing massage, luxurious facial, manicures and pedicures and much more at this haven of tranquility in the midst of the city. Choose from their long menu of massage types whether you want a traditional Swedish massage or a less traditional hot lava shell massage, this spa can accommodate. Get a black Baltic mud wrap or a coffee rub to revitalize your skin and give you a healthy glow. Choose from their specials and packages or pick and choose from the menu to create your own spa day. If you need a break from your daily routine, stop here and have the most pleasurable spa experience in New York City. At Euphoria you can treat yourself to a soothing massage, a pore cleansing or a sauna treatment. The indoor environment will make you wish you never have to go back to the crowded streets of NYC. The spa experience at Euphoria will create a feeling of well-being and healing. You can use the sauna to help you warm up, relax and detoxify for just $1 a minute. You will be rewarded for your loyalty. For every $10 you spend on any of the products, services, and gifts, you will be given $1 at SpaCash. Working hours: Monday 10 AM – 8 PM, Tuesday 1PM – 8 PM, Wednesday to Friday 10 AM – 8 PM, Saturday 10 AM – 7 PM, Sunday – closed. Extend your spa experience by visiting Exhale Upper East Side Spa, one of three Exhale spa getaways in New York that offer an excellent blend of rejuvenating spa therapies and invigorating Core Fusion classes. Featuring a yoga studio, two Core Fusion barre studios, multiple therapy rooms, a peaceful zen lounge, a steam room, and lockers stocked with robes and slippers in fully-equipped changing rooms, the spa provides its customers with an unparalleled spa experience. Join the Core Fusion classes and let this full body ballet-inspired workout give you the body you have always wanted, or treat yourself to an evening of relaxation and enjoy any of the eastern healing therapies or soothing massages that will renew your body and spirit. Visit the website to get more information or make an appointment.